We hiked into the parking lot and Rubylocks immediately yogi'd us a ride into town! Awesome. Now come a few days of eating and rest, ice & foot elevation. Meanwhile, Dionysus is feeling much less pain - so he appears to be on the mend. 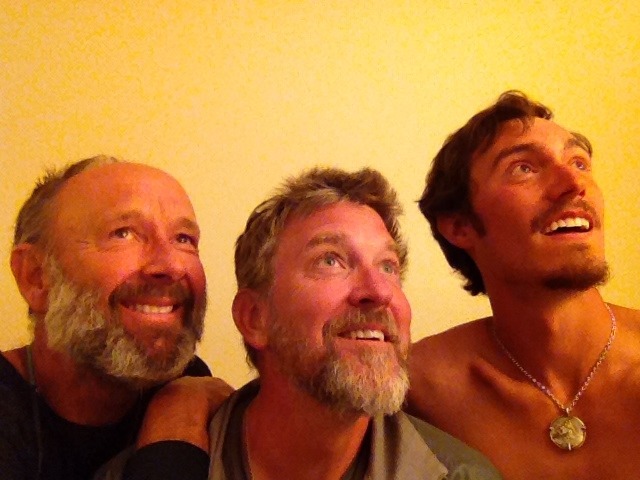 We have passed the 1/3 mark of the PCT. Much logistical work to do here in anticipation of the remaining 2/3. In honor of Gay Pride, we include this quicky photo of scruffy us trying a joint Joan Crawford head pose (though it's just possible Dionysus is going for a Douglas Fairbanks, Jr. visual quote). 27 June - Day 67 - Into the Hell of Mozzies. 24 June - Day 64 - Peaks & lakes & passes, Oh My! 9 June - Day 49 - "Now the real Sierras start."